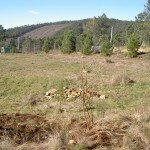 Planting new trees has always been a significant part of our plan for Casalinho. 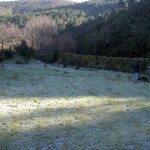 Trees to enhance and repair our environment, to feed us, our animals and our soils. Almost all the fruit trees on this property were destroyed before we knew it, but we’re told that the lower portion of the property alone was home to over 2500 fruit trees at one stage. We’ve planted a lot, but we’ve a good way to go still! During the later part of 2014 we were very fortunate to receive contributions to our tree fund from several generous volunteers. As the majority of trees prefer to be transplanted in their dormant season, the winter months, we have been impatiently waiting to being able to begin this stage of our tree plantation project. So last week we have excitedly brought home a couple of Mulberry trees to be part of the shower area project, some Black Walnuts for the first bottom field where we shall soon be starting work on a pond system, and over a hundred Quercus Rubra, American oak, which will eventually be all over the place, with the majority replacing cleared pines in the forested area. There are mature quercus rubra near to us from which we have collected and grown our own seedlings, and will continue to do so, but buying two year old seedlings in bulk moves our project forward by several years. 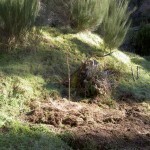 Pleasingly, we’ve been able to purchase this first batch of trees from a local project. After a break over Christmas and New Year to recharge our batteries, this has been our first week hosting volunteers again. With close to 120 trees needing to get their roots in the earth, our timing couldn’t have been better 😉 Thanks to Stephan, Sara and Sam who have been the muscle behind this project so far. If you could donate a tree, then please click through to paypal or drop us a line. You can read about the varieties we’re particularly keen on adding here. 1) On a crisp, frosty morning, there’s not better way to keep warm than digging holes! 2) One of the four black walnuts in place. This area is where we will site a pond, and these walnuts will surround one side. 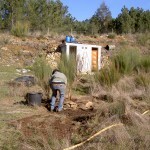 3) Sara is mulching a mulberry in front of the shower. 4) The other mulberry in place, looking back towards the driveway.